On this day in 1593, the colourful Christopher Marlowe, poet, playwright, lover of tobacco and boys, and supposed spy, was fatally stabbed in a tavern in Deptford, under somewhat mysterious circumstances. The Coroner’s Inquisition at the time concluded that he had been killed in self-defence by one Ingram Frizer, during an argument about a bill or “reckoning”. It is believed that his death is alluded to, in his friend William Shakespeare’s “As You Like It”, as “a great reckoning in a little room”. Marlowe is buried in the ancient church of St Nicholas in Deptford. (*) Readers may also be interested to know that the recently-discovered site of the “Rose” playhouse in Southwark, where many of Marlowe’s plays were performed, is open to the public every Saturday from 10:00-5:00 (entry is free, although donations are of course welcome). This entry was posted in 16th century London, London History, On this day, Post-Medieval, Theatrical London, Tudor and tagged As You Like It, Christopher Marlowe, Deptford, Great reckoning, Rose Theatre, St Nicholas Deptford, William Shakespeare on May 30, 2018 by Bob Jones - The Lost City of London. William Shakespeare was born on or around this day in 1564, and died on this day in 1616. Although he was born and died in Stratford-upon-Avon, he spent almost the entirety of his productive working life in London, and in truth is much more a London than a Stratford figure. He arrived in London sometime between 1585 and 1592, and lived in the parish of St Helen, near “The Theatre” and the “Curtain” in Shoreditch, in 1596; in the Liberty of the Clink in Southwark, near the “Globe”, in 1599; and in Silver Street, near the “Blackfriars”, in 1604. This entry was posted in 16th century London, London History, On this day, Post-Medieval, Theatrical London, Tudor and tagged Blackfriars, Curtain, Globe, Shoreditch, Silver Street, Southwark, St Helen, The Theatre, William Shakespeare on April 23, 2018 by Bob Jones - The Lost City of London. On this day in 1613, according to the surviving Deed of Conveyance in the London Metropolitan Archives, William Shakespeare bought for £140 a “dwelling house or Tenement with th’appurtenaunces situate and being within the Precinct, circuit and compasse of the late black Fryers London, … and now or late being in the tenure or occupacion of one William Ireland or of his assignee or assignes; abutting upon a streete leading downe to Pudle wharffe on the east part, right against the Kinges Maiesties Wardrobe; part of which said Tenement is erected over a great gate … ” [the former entrance to the Black Friars Priory, dissolved by Henry VIII in 1538]. There is no evidence that Shakespeare ever lived in this particular house in London, returning to his native Stratford-upon-Avon in 1613, and dying there in 1616, but he is known to have spent almost the entirety of his productive working life in London, and in truth is much more a London than a Stratford figure. He is known to have arrived in London sometime between 1585 and 1592, and to have lived in the parish of St Helen, near “The Theatre” and the “Curtain” in Shoreditch, in 1596; in the Liberty of the Clink in Southwark, near the “Globe”, in 1599; and in Silver Street, near the “Blackfriars”, in 1604. “This royal throne of kings, this sceptr’d isle, This earth of majesty, this seat of Mars,|This other Eden, demi-paradise,|This fortress built by Nature for herself|Against infection and the hand of war,|This happy breed of men, this little world,|This precious stone set in the silver sea,|Which serves it in the office of a wall,|Or as a moat defensive to a house,|Against the envy of less happier lands,|This blessed plot, this earth, this realm, this England”. This entry was posted in 17th Century London, London History, On this day, Post-Medieval, Theatrical London and tagged Blackfriars, King's Wardrobe, Puddle Wharf, William Ireland, William Shakespeare on March 10, 2018 by Bob Jones - The Lost City of London. To mark the beginning of ‘Movember’, here’s a look at some of the facial hair styles adopted by the Tudors and Stuarts, ranging from “boyish” to “strictly no-nonsense”, by way of the peculiarly popular “rakish”. Top row, left to right: Christopher Marlowe; “The Laughing Cavalier”; Francis Drake. 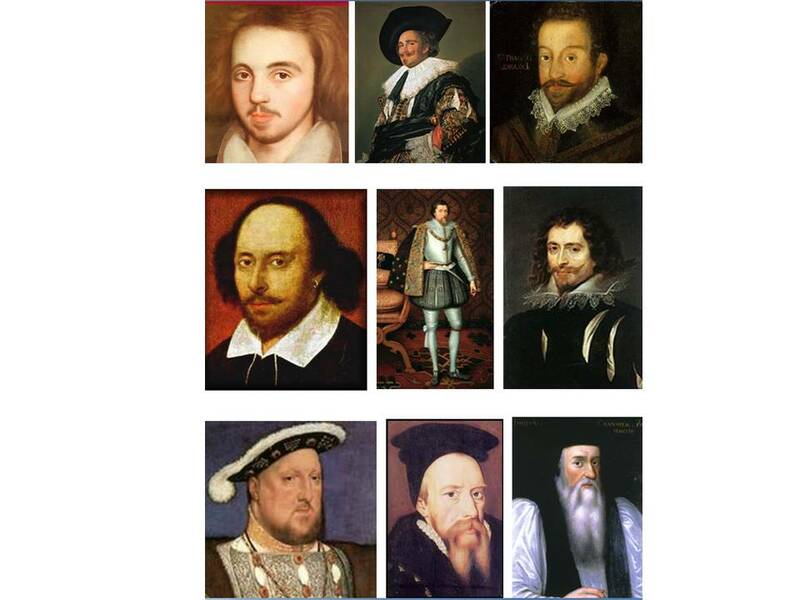 Middle row, left to right: William Shakespeare; James I; James I’s “favourite” George Villiers, the First Duke of Buckingham. Bottom row: Henry VIII; William Cecil, Lord Burghley; Thomas Cranmer. This entry was posted in 17th Century London, Quirky stuff and tagged beard, Christopher Marlowe, Facial hair, Francis Drake, George Villiers, Henry VIII, moustache, Movember, Thomas Cranmer, Tudor, William Cecil 1st Baron Burghley, William Shakespeare on November 1, 2013 by Bob Jones - The Lost City of London. 12th September 2013 – I’ve just got back from a fascinating behind-the-scenes tour of the London Metropolitan Archives (www.cityoflondon.go.uk/lma), organised by the London Historians (www.londonhistorians.org). 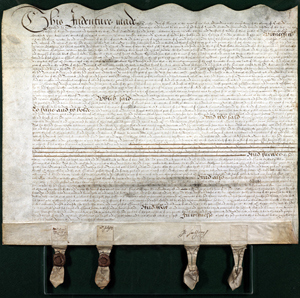 The highlight was the “Shakespeare and London” exhibition, which features not only “The Shakespeare Deed”, a property deed signed by Shakespeare (one of only six surviving examples of his signature), but also other documents from his lifetime, along with maps, photographs, prints and models which explore his relationship with London. The exhibition runs until 26thSeptember 2013. This entry was posted in 17th Century London, discovering london on foot, Guided Walks, Shakespeare, Site is on a Lost City of London Tour, walking tours and tagged Blackfriars, Shakespeare, Shakespeare's signature, William Shakespeare on September 12, 2013 by Bob Jones - The Lost City of London.